I have two links for at least two of my readers and off-blog conversations, but I’m sure the rest will enjoy it. How to fold a t-shirt. How to iron a shirt properly. Emma learned the difference between Good Scare and Not So Good Scare. Sneaking outside, hiding and not answering your mommy when she starts hollering your name in increasing volume: Not So Good Scare. Across the street from our apartment-hotel is an Elk Lodge. 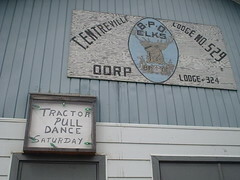 They are having a Tractor Pull Dance on Saturday. I almost wish I was here on the weekend to see it, but we have plans with a drum sander and a bedroom floor, alas. Yesterday, we went to the Freshmart. TWICE! Exciting times! Emma reintroduced herself to both cashiers and explained the drama of our DVD remote batteries dying. A customer said that if we were at a hotel like Emma said, maybe the hotel should replace the batteries, then I was stuck explaining it’s just a half-empty apartment, really. This was after she insisted that if we were going to be watching her kid’s movies we brought, we needed treats. She picked out a bag of Oreos for herself and a bag of chips for me and Daddy, ones that she knows Daddy likes. Back at the checkout, talking with the first cashier, she suddenly declares, “I can run REALLY FAST!” then proceedes to show us by running down the nearest empty aisle. The second cashier during our secodn trip is so impressed by congenial Emma, she lets her rings stuff in. She was going to let Emma ring in the cash tendered and help hand over the change, but Emma lost interest. Heck, she was only back there to hug her like she does for all clerks. Also, along the drive I pointed out the fields again so she could see the potatoes growing bigger than last time. We talked about how the farmers sell the potatoes to the grocery store so we can buy potatoes for our house. She got sad for a minute while she worried out loud that maybe the farmers sold all their potatoes and didn’t have enough for them. Acre after acre rolled by as I assured her the farmers have plenty of potatoes to eat. 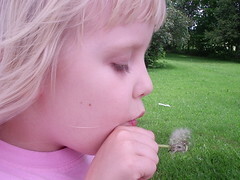 Without the usual distractions, I am carefully observing Emma’s world – where every stranger is a potential friend, everyday items that appear normal are the stuff of fantasy and so interesting to figure out, and words and numbers are things you play with. The sun shines on a whole new day of adventures. It’s a pretty nice place to be. Sorry to leave you all hanging like that. Had a busy weekend so far, had a tough time getting to both the computer and the camera. 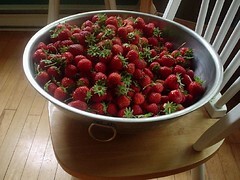 Not only did I have to spend plenty of time canoodling with my honey, we had to pick strawberries. Because we are so busy, Mom and Carl actually had to stop in to talk to us. We made them pick strawberries too, but they got to take a bowl full home. Mom really likes my hair. “What does Ron think?” she asked, when he was not more than 4 feet away from us on the other side of the row. “He’ll get used to it,” I told her. “Hey!” came a shout from behind us. “I never said I didn’t like it!” Big grins all around. We have Ron’s flight moved to an earlier time – then delayed. He’s real impressed. Sarah bought herself some faux-Converse high-tops in red (see similar here) – to go with her biege/red/black plaid pants she altered into capris. A studded belt, wrist full of bracelets and red or black tshirt completes the look. It is hot and muggy while Emma insists on wearing a velour ballerina outfit. And I can’t even find my old webcam. When my honey called me earlier to say he was taking an earlier flight, I on-purpose neglected to tell him I did my hair. I went next door for a $12 hair cut and requested it super-short. WAY short. Family will know how short I really do like it. She even got out the clippers. Then when I came home, I cracked open the hair dye I bought yesterday out of the markdown bin at the grocery store. Extra bleached blonde, less than $5. You know, you have to prove how blonde you really are inside to wear this color, and I knew it wouldn’t look exactly like the model on the box. Besides, any box that could also promise knocking me down a few dress sizes in a couple hours wouldn’t exactly be in the clearance rack, would it? So now I am, in the words of the girls, WOW-is-that-ever-BLONDE blonde. I like how Emma phrases it. “Yay! It’s just like my favorite color!” Which is yellow. And while letting the extra-deep conditioning set in, I slicked it all back and determinded that if I had to, I wouldn’t look half-bad bald either. It certainly detracts from my hips, so that’s a plus. The only down side so far as I can see, is that it highlights my dark and unruly brows. Pictures of the hair will come tomorrow, because Ron has my camera.